But since we are in the middle of mango season here in my backyard: Ta-da! 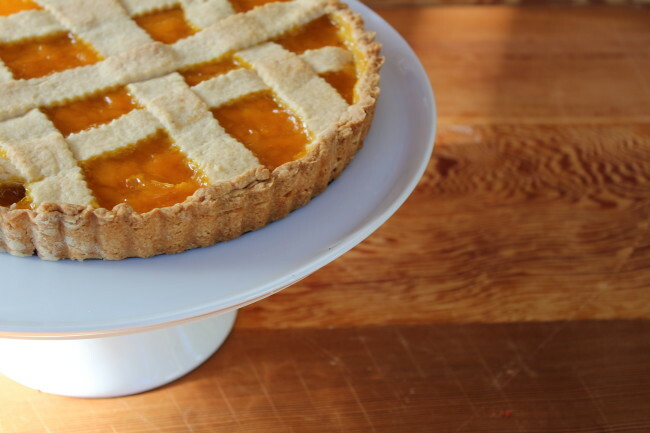 A mango crostata it is with mango jam I have recently made. And this is a special dessert. We are celebrating Aggie’s baby that will soon be here! I was tickled when I found out about her virtual baby shower and so happy to be a part of it. You see Aggie was a blogger that inspired me to start my own food blog a few years back. I was a huge fan of Aggie and her healthy and delicious recipes. Soon after launching my blog we became friends and I let her know she was my inspiration. We share a Sicilian connection and reminisce about special meals during the holidays. Who knows maybe one day we will have a crostata together and a cup of coffee? In the meantime, AUGURI AGGIE! Congratulations, sweet lady! Here is some of the jam I made today. I know these won’t last too long! Look at all these delicious recipes we made just for Aggie! Yes, baby. You are too cute! I probably should’ve chilled my dough longer but there were people waiting for a taste. There wasn’t time and you know what, it turned out just fine! 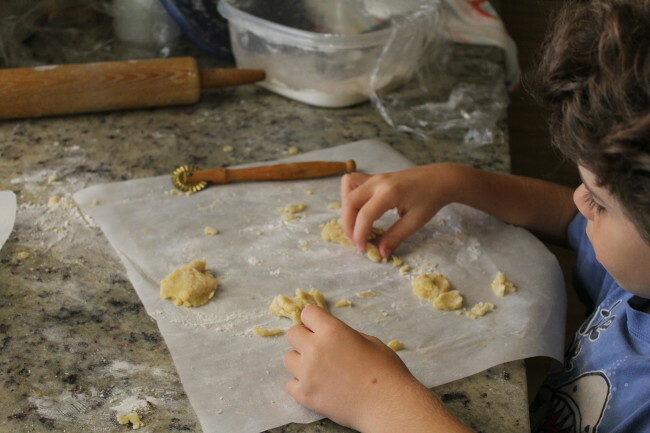 Need to see some photos with steps on how to roll the dough? Check out my ricotta crostata. The filling is incredible! Love apple desserts as much as I do? 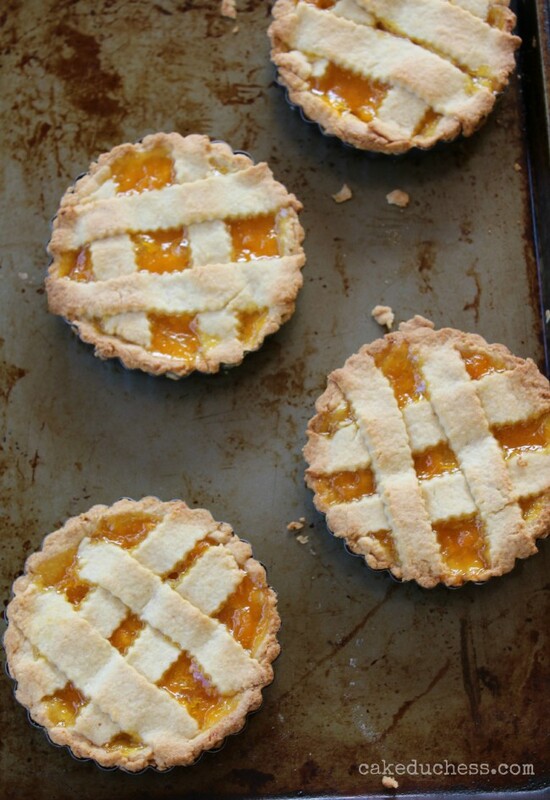 There is this strawberry-apple crostata and this apple and orange marmalade crostata. When blueberries are season, make this blueberry crostata. The filling is crazy good! My first crostata I shared here was from a Daring Bakers challenge and it was a Nutella crostata. Back when Foodbuzz was around, it even made their Top 9. Thanks for stopping by and for your sweet comments. I appreciate your support and friendship. A big thank you to Julie, Sandy and Liz for putting the shower together! In the bowl of a food processor, add the flour and sugar and process a few times to mix together. Next add the butter and pulse a few times until the mixture looks like wet sand. Add the egg and yolk and process a few seconds more until the dough forms (this should be about 5-7 more pulses). Be sure to not overprocess the dough. Dump the dough from the food processor bowl onto a lightly floured counter. Form the dough into a two disks (one slightly larger than the other) and chill in the refrigerator for about an hour. When dough is nicely chilled, remove them from the refrigerator. Roll out the larger disk of dough between 2 sheets of plastic wrap into a 13-inch round about 1/8 thick. 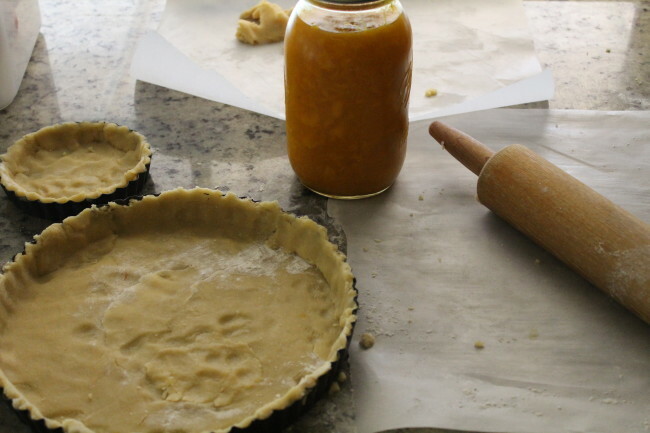 Spray an 11-inch fluted tart pan with removable bottom with baking spray. Gently wrap the dough over the rolling pin and place it over the tart pan; release the rolling pin and let the dough fall into the tart pan. Press the dough softly into the bottom of the tart pan. If some of the dough breaks while you press it into the tart pan, that’s not a problem. Simply piece the dough together. Spread filling in chilled shell. Roll out the remaining piece of dough to 1/8-inch thickness Cut out 5 strips and place them 1 inch apart on top of the filling. Cut out another 5 strips and place them 1 inch apart diagonally across first strips to form a lattice design. Trim edges of all strips flush with edge of shell. Carefully place the crostata on top of the baking sheet. Bake for about 40-50 minutes at 375 F, or until the crust is golden brown. Let cool completely before removing from tart pan. Best eaten the first day but makes a lovely breakfast the next day. Luca is SO sweet…what a terrific little helper! And both your crostata and jam look amazing!!! 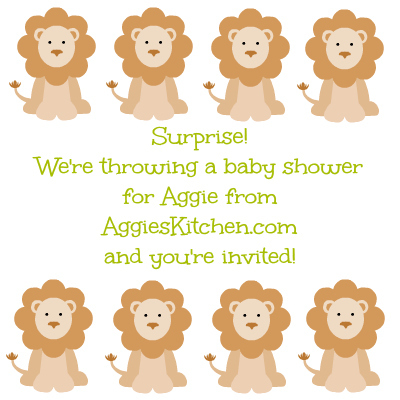 Perfect for a baby shower…please extend my congratulations to Aggie! These pies are so pretty. I love that warm orange color peeking through the lattice. Do you really have a mango tree??? 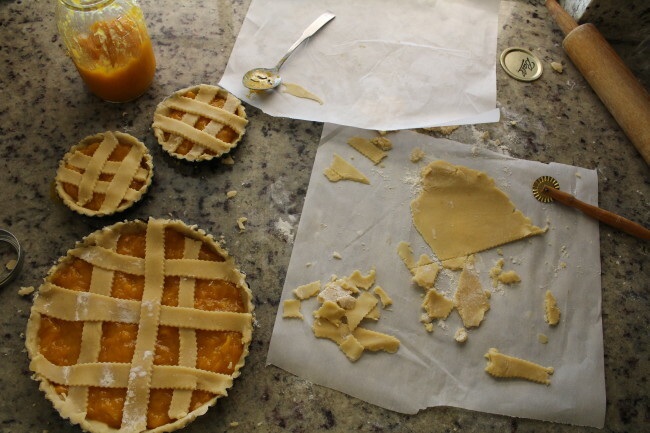 You know I'm jealous of your mango trees… you get to make jam and eat in in a crostata too! This is a gorgeous dessert Lora! This is just gorgeous. I love mango, but have never cooked/baked with it, always use it raw in salads, etc. I need to try this! This looks fantastic! I'm wishing this shower weren't quite so virtual so I could try some of this right now. I'm so glad to be a part of this event with you…virtual or not! Oh my this crostata looks divine. 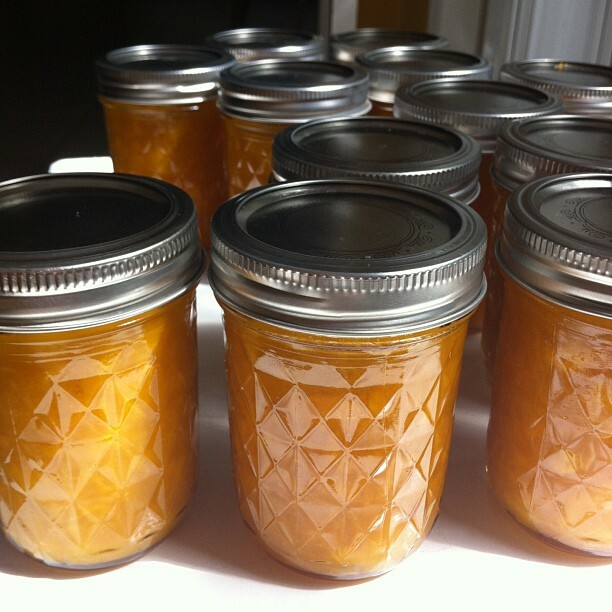 I love that you make your jam. 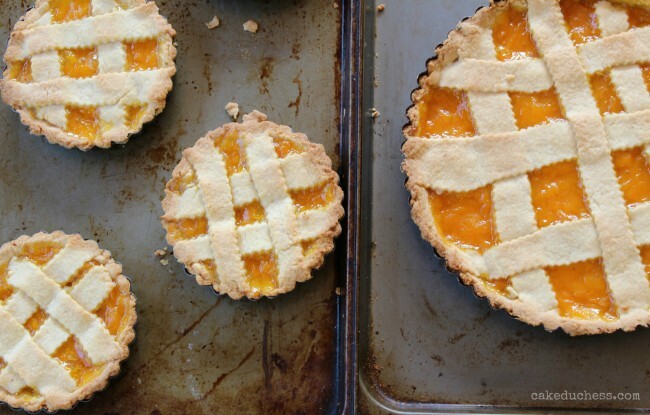 I love mango and never thought to incorporate the sweet fruit in a tart. Can I get one of those jars? 😉 This is gorgeous beyond words, Lora! I love it so much. So happy you joined in on the fun! What a wonderful event and so many bloggers pitching in to throw Aggie a baby shower! Your crostatas are making my mouth water, Lora. Your crust is perfection and that vibrant orange colour from your mango jam is out of this world. Gorgeous! Such a sweet thing of you'll to throw a shower, congrats Aggie. The crostadas look delish and the color is heavenly. I do enjoy anything mangoes and I things this is a very smart idea. 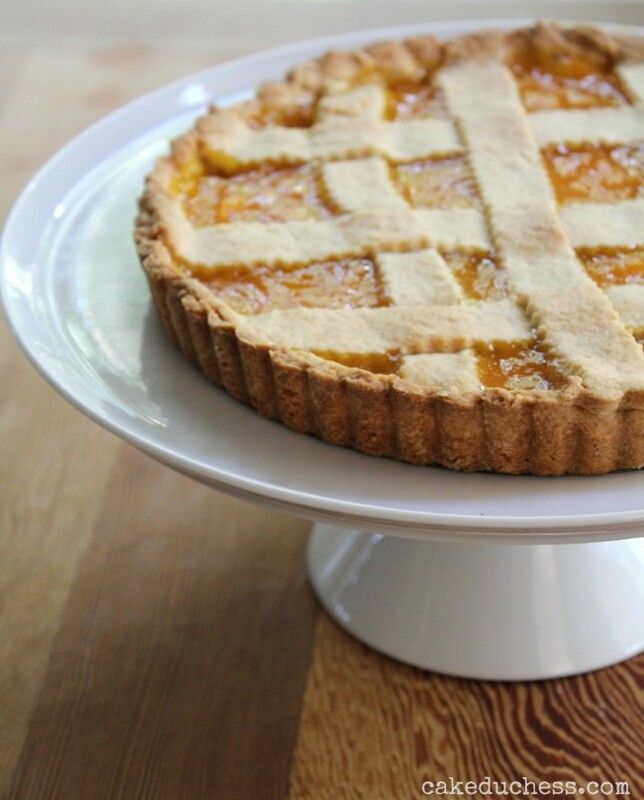 Beautiful crostata, I love the mango jam! Lora – this is gorgeous! I'm so glad to see that someone made a crostada for dessert! Pies and tarts are my favorites. Perfect Mango tart and I am drooling at the thought of it here. Wish it was still mango season in our corner. You have no idea how touched I am by this shower, such a surprise! Thank you so much for being a part of it, and for the well wishes. love you friend!! PS you know I'm slightly baking challenged, but I think I can make this!!! Mango is my favorite dessert. I have never put in my baked goods…this must change. The perfect baby shower dessert! You have a mango tree, how awesome!! This tart looks downright amazing!! This is SO beautiful – lovely lovely flavorings!